When I ask a Tech, what the greatest danger is they face as an Appliance repair Technician, the immediate answer is almost always electricity. Of course they are right, but apart from electricity we face other dangers, both for ourselves and our customers. For ourselves, the other greatest concern is injuring ourselves handling appliances. Either by doing unwise things like trying to manhandle an appliance when two people or special equipment is needed, or by making a mistake which results in personal injury and/or damage. Dealing with literally thousands of calls per year, it is inevitable that something will happen at some point, no matter how much training, how careful we are and how many repeated cautions and reminders we provide. Another danger we face is that of water damage. This type of damage can be very significant and rarely occurs where it can be seen immediately. Rather it occur silently, and over a long period of time in the form of small leaks which drop by drop over time, can cause substantial damage. The huge leaks are obvious when they occur and can generally be mopped up without an issue, and very little damage resulting unless left standing for long periods. Even then, damage is rarely very significant. Slow leaks on the other hand are different. If allowed to continue for long periods of time, they will cause floors to lift, cabinets to warp, dry wall to crumble and collapse and could create conditions suitable for mold to develop. One of the more common slow leak issues we have seen, is when an appliance needs to have the water supplied to it shut off, in order that the unit can be repaired. The water valves/faucets supplying these appliances may have been in the open position for years and when closed and then reopened, expose a failure which manifests as small leaks, sometimes after the technician has left. In other situations, we have seen leaks that have been present for long periods of time only to be discovered as the tech is preparing to work on the appliance. When pointed out, the slightly lifting or warped floor, musty smell or damp wall, all then start making sense but at this point, damage is already done. 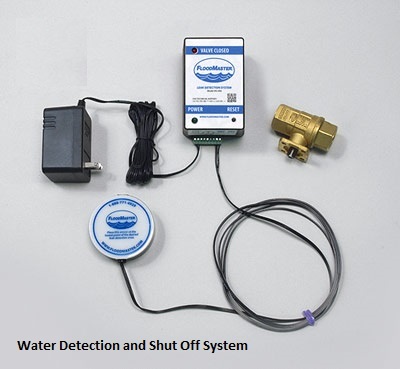 There are several devices that are available to detect, and halt the flow of water in the event of a water line or system failure. These are very helpful but do not operate well for slow leaks over time. The best defense against such leaks is frequent visual inspection of the water valves/faucets and lines supplying water to your appliances. Just being observant and vigilant around any appliance using water can avoid the problem. Check your dishwasher every time you use it to see if there is water on the floor. The same for your washing machine. Also remember your refrigerator, which will likely have a water line for water and ice dispensing. If you suspect a problem, attend to it immediately. Call an Appliance Repair company if you are unsure or suspect a problem. A service call will be well worth the cost of you are able to preempt an issue. There are also electronic detectors which are available which can help alert to high levels of moisture in the vicinity of an appliance. These do however need to be strategically placed in order to be effective, and it is very difficult to predict just where the water will eventually begin to collect for these to work. Being vigilant to signs of water in the wrong places is a better solution in my opinion. For our techs, whenever they work with any part of a system which involves water, they know to take an extra few moments to check that no leaks exist. They will also often also ask the customer to keep an eye out for any potential leaks that may develop after they leave. So apart from working with electricity and handling heavy appliances, water is probably one of the most dangerous things we have to contend with on a daily basis as techs.